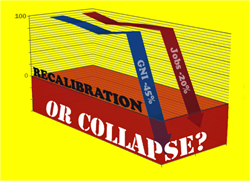 Recalibration is, simply put, ‘a subsequent correction or adjustment’. It’s a common procedure in our daily lives, as we make minor fixes to readjust things from computer displays to television signals. Gross National Income (GNI) and 75,000 jobs were written off – 45% and 20% of the respective original forecasts respectively! Where was the GNI lost? What type of jobs disappeared? Such massive reductions demand clarification; they must not be casually dismissed as ‘recalibrations’. In the absence of adequate explanations from PEMANDU with regards to these unexpected changes, REFSA analysts Ong Kian Ming and Teh Chi-Chang conjecture several possible reasons, including extremely exaggerated forecasts by certain EPPs to the point that the original GNI contribution forecast was double the level now considered realistic. The massive scale of such embellishment borders on fraud that the ETP labs and PEMANDU’s highly-qualified staff and expensive consultants failed to detect. Read on: “Dissecting the ETP Annual Report: Part 4 – 45% of GNI and 20% of jobs disappeared in ‘recalibration'”. I attended one of the ETP labs a year ago and my perception? 1. Hot-housing. Trying to solve issues within a few days or more accurately ‘paper-envelope’ calculations to prove viability of ETP. I was incredulous !! A lot of the so-called projections are just ball-park sometimes tweaked to make it look good. As an active member of the profession, I remembered some of the issues addressed in the ETP labs were not so simple to be solved in 1 day with oddles of ringgit thrown in. 2. The PEMANDU officers are experts??? There are as ‘expert’ as the nearest man in the teh-tarik stall. The only difference is that they speak accented english whilst the opinionated ‘teh-tarik-everyman’ speaks in … never mind. To make, at the very least, an ‘informed decision’, said officer must at least be familar with the industry the ETP is trying to address. They must also be proficient with macro and micro economics from the Malaysian social-political-economical perspective. It is therefore NOT surprising that all these dirt is congealing up the mess. BN leaders are smart in dishing out gobbledegook in the hope of deceiving the less-informed of the rakyat. Figures and stats can be slanted to make the government seem intelligent.